SILICON SLOPES, Utah – September 26, 2016 – Domo today announced it has been named a winner in MediaPost’s 2016 OMMA Awards in the technology and web services category for an online video campaign it developed to tell the Domo corporate story. This is the second consecutive year Domo has been recognized with an OMMA distinction. Domo, a cloud-based software company, wanted a way to enhance brand awareness and kindle excitement for its upcoming user event, Domopalooza16, where it was going to reveal a big product update – the Business Cloud. For its first four years, Domo had done a great job getting its brand into the market, but it wouldn’t talk specifics about its product. As a result, people had heard of Domo, but very few had any idea what the company did – and that was the organizing idea for the project. To get people talking, Domo enlisted Academy Award nominee Alec Baldwin to portray a very important CEO who didn’t know what Domo was, but somehow knew he needed it. 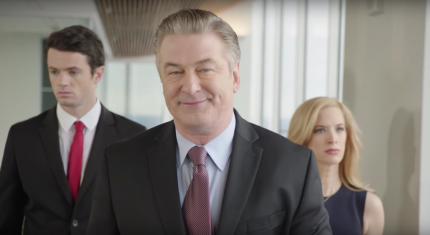 The Baldwin teaser spots and corporate video, which told the entire Domo story, were released over two weeks across Twitter, Instagram and Facebook. Highly successful in catching the attention of curious onlookers, the various video snippets were viewed half a million times within the first 48 hours. Three Baldwin teasers were even parodied by a competitor drawing more attention to the Domo brand and giving Domo’s CEO the opportunity to have a fun engagement with followers on Facebook and Twitter. The competitor quickly pulled its three parody videos down after realizing they were not having the intended impact. The OMMA Awards (Online Marketing Media and Advertising) were created in 2004 to honor agencies and advertisers that push the potential of digital advertising. Mediapost, the partner and sponsor of the OMMA awards, has always been at the forefront of covering the digital space and recognizing excellence in digital marketing. The development of this video series was a highly collaborative effort, with more than a dozen individuals contributing to the video design – including production and content development by Domo, Deep Blue Films’ Isaac Halasima and production by A76, Dark Rider Productions and Miscellaneous Entertainment. Wildly successful in meeting the campaign’s objectives and igniting excitement for the conference, Domo was selected as the sole winner in its category for its creativity and excellence in brand awareness and web services. In 2015, the company was recognized in the website excellence category for its website and online platform. The full list of OMMA Awards winners can be seen here. Domo helps every employee – from the CEO to the front line worker – optimize business performance by connecting them to the right data and people they need to improve business results. Domo’s Business Cloud is the world’s first customizable platform that enables decision makers to identify and act on strategic opportunities in real time. The company is backed with more than $500 million from the world’s best investors and is led by a management team with tenure at the world’s most well-known technology companies. For more information, visit www.domo.com. You can also follow Domo on Twitter, Facebook, LinkedIn, Google+, Instagram and Pinterest. Domo is a trademark of Domo, Inc.